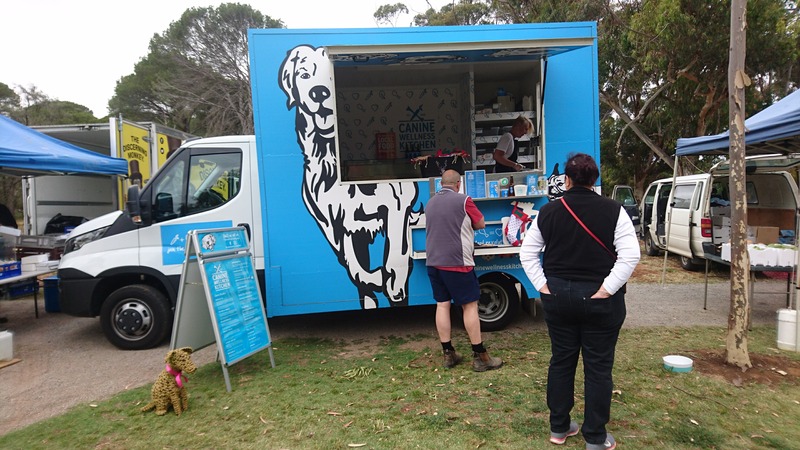 Describe the moment that triggered the concept of starting Australia's First Food Truck for dogs? We always went out to food truck events, restaurants, markets and festivals with our dog Fred and poor Fred always got left over table scraps or the odd hot chip. He ended up just begging for food the whole time and that’s when we had the moment, wouldn’t it be great if we could have a food truck dedicated to just dogs. A truck that sold healthy street food just for dogs. No human stuff just canines. Yes, at the moment we just have Fred the blue roan Cocker Spaniel. He is the face of our label, Freddie’s froth (dog beer). Fred probably has one of the most envied canine jobs in Australia the official taste tester. Fred often comes with us in the truck, and we often joke he has this swagger to him, he swaggers around like Mick Jagger. He is one cool cat (mind the pun) Fred. What do you love the most about running the Canine Wellness Kitchen? Has to be the dogs. All the different dogs, big, small, medium and their different personalities. Every dog is always sooooo happy to see you and I get smothered in dog kisses all day. Best job ever. What's your most popular product? That’s a hard one. It has to be either our mouth watering or should I say drooling dehydrated chicken breast or our dog beer brand Freddie’s Froth. We came up with the concept of a dog beer initially with the insight that everyone including your 4 legged friend should have the opportunity to enjoy a frothie or two. And really the pooch pints have just grown from there. With the popularity of our lager (Freddie’s Froth) we then moved into dark ale, pale ale, even cider and more recently we developed a pinot range. We have some new exciting beverages coming this winter through to summer so watch this space. 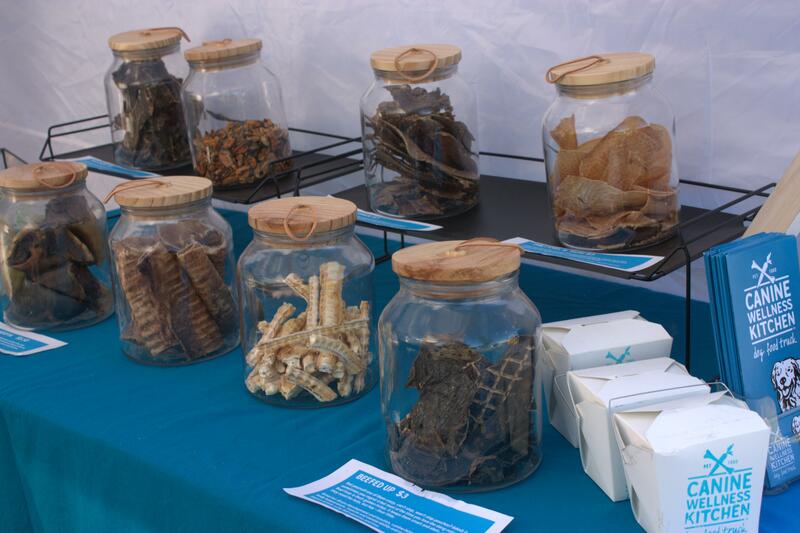 We will even launch one at Eynesbury Farmers Market. The cool thing about all our pooch pints are they are healthy and nutritionally beneficial for a canine’s health. Unfortunately we cannot say the same about human beer. The raw food revolution is based off the principles that a canine (and feline) needs to meet its nutritional needs of a balanced meal by eating a raw diet that replicates one from the wild, such as a wolf. This evolutionary approach is based on the canine eating a diet true to their nature, which is a combination of raw meats and bones, offal, vegetables and fruits. We designed our recipes under our first pet food label Because I Luv My Dog some ten years ago and continue to distribute this label under the Canine Wellness Kitchen. We have been educating pet owners for over ten years now you are what you eat, if you wouldn’t eat it, why would you feed it to your dog. And the good news is people are actually starting to understand clean eating for canines and questioning ingredients present in commercial pet food. We only use human grade ingredients – so human grade chicken, beef, lamb, kangaroo etc. The cool thing about the raw food feeding program is that it is so simple to follow. We do all the hard work, the owners just need to serve. The benefits of feeding this diet are amazing. Describe your dog food expert journey? My background started when I worked in advertising agencies and worked on major pet food labels. Here is where I first got an insight into pet nutrition. From there I studied animal nutrition. I also studied some interesting animal behavioural courses including canine myotherapy and hydrotherapy. Tip Number 1 – Any fresh meat that is refrigerated targeted towards pets (ie commercial pet food in the supermarket, pet store) that has a shelf life longer than 48hours generally is not real meat – if you don’t need to freeze it than I would be questioning why not. Read the ingredients, don’t fall for the advertising. (trust me we wrote it). Probably the first day we opened the hood. We weren’t sure if any dogs would come. I remember clearly Laura and I were in the truck, and the hood was closed, the market hadn’t started yet and we were busy prepping, stamping bags, getting the till ready for trade. We were really slow and running behind schedule being our first trading day and hadn’t yet opened the hood to see out the front of the truck. The second one would have to be when Dr Chris Brown came to the truck and bought a 6 pack of Freddie’s Froth, that was pretty cool.